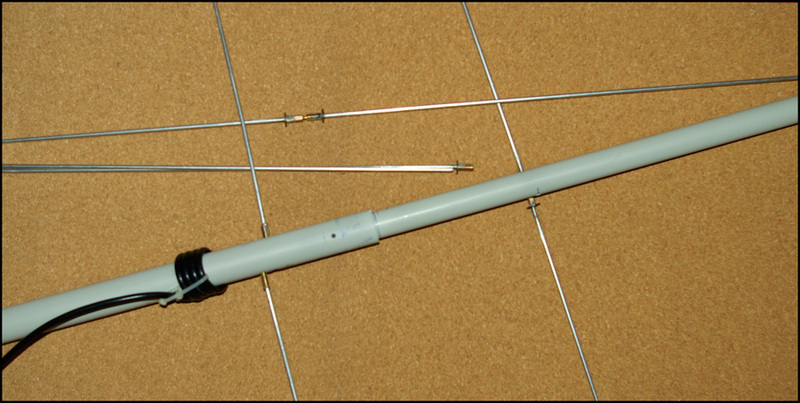 I am thinking of making my own 3 element 2m yagi antenna. Which will be able to be disassembled and stored in the pole. So… I’m facing some peculiar design issues. The most important of all is that the only materials available for the elements are brass welding rods or steel welding rods. I am kinda amiss on the brass velocity factor, google did not get me anything, and I understand that the general design uses either copper or aluminum for the elements. Do I follow the general instructions, resize the driven element according to SWR, and then resize the other elements according to the driven elements final length? The next issue I have is the distance between the elements. Related to this, another issue is the position of the driven elements. In these designs they are not one opposite the other. How critical is that? I have only 4cm for both the driven elements connections, and that without accounting for the 2x1cm for the clip to hold the removable elements. Next I would like to ask if it is possible the driven elements to be ½ inch higher on the pole than the other elements. And last how about baluns? I have seen the Hairpin style and the “Dirty” balun. Also one design i saw suggests feed wire running towards the back of the pole till it gets close to the reflector. Is that an improptu balun? Honestly the brass ones will work fine. In general you will have to do some fine tuning, mostly on the driven element. Probably has to do with their calculations. Although ideally on a 3 or 4 element Yagi the elements should be .2 (just less than a 1/4 wave) Wavelength apart. Depends on who you ask. Will it operate to its peak performance, probably not. Will it work for what you are doing? Yep. Use the hairpin style. You then adjust the length of the driven elements to lower the impedance. That should be easiest to tune. I looked up some info in the ARRL Antenna handbook and I was going to take some pictures of their charts, but here is where they took their information from. That should give you just about everything you wanted to know about Yagi designs. Personally speaking, dont over think it. If you end up taking this apart and putting back together and/or transporting as the elements get banged around/bent etc, you are going to change the characteristics of the antenna. Does it really matter? Again in your case probably not, unless you are looking for a lab grade antenna. As long as you can keep your SWR below 1.5 to 1, your radio will stay happy. Ive built plenty of makeshift antennas over the years and theyve worked just fine. Thats the great thing about ham radio, it doesnt have to be pretty, it just has to work. I understood the rest as a motivation to go forward regardless. My favorite take down antenna is the Arrow antenna. Yes it's made from aluminaum arrow shafts. If your using brass welding rod pick a size thats big enough to thread, then use inserts or couplings to screw the brass into. The inserts would be metal for the refector and director. Plastic for the driven element. You would mount these on a square boom so you could store the elements in the boom when not in use. For the most gain try .2 wave lenths reflector to driven element. .1 wave lenths from driven to director. You'll need to match the 27 to 35 ohms impedance to 50 ohms for best operation. well, I will be getting the prize for the slowest HAM project ever build. 4 years latter and it is not 100% done. In the process the design changed to a 4-element one, a prototype was built, the fed point location became internal, boom thickness was downsized, etc etc. And practically it was build from inside out, a tedious process with many measurements and 3 models made. Half of them for lack of a bench drill. Anyway, here it is one soldering away from ready. I want to suggest that you not worry about velocity factor of construction material as it matters so little . The element spacing also has such little effect on beam width and gain that I normally just use .15 wavelength for element to element distance and as far as SWR....while this will be a indication of construction....just work for a RANGE as few antennas are actually 50 ohms and most YAGI's are actually in the 50 to 80 ohm range.. DON'T DWELL ON SWR,once it is in range ,leave it be. Many a good antenna has been ruined by the owner cutting it to death...adjust the match (I also prefer hairpin) and leave element length alone or you will wind up engineering out most of the good that a beam can provide. yes.... actually the prototype fell right in 1,2 from the start. Good enough. But now I will have to check again (preoccupied with a million things I did not even measure the new driven elements span). Believe it or not Carl, I do take what you have said to be about SWR into consideration. In the sense that I DO settle for 1.2 or a bit more. And that my VHF antennas will have to work from 142 to 151 (civil protection use on the land mobile region), and somewhere in there SWR will be approaching 2 no matter where the best value is placed. That is a good design. I made one from an old tape measure on a piece of PVC and used a bit of ladder line as the match...total cost was less than $2 ....if I had purchased the tape measure. 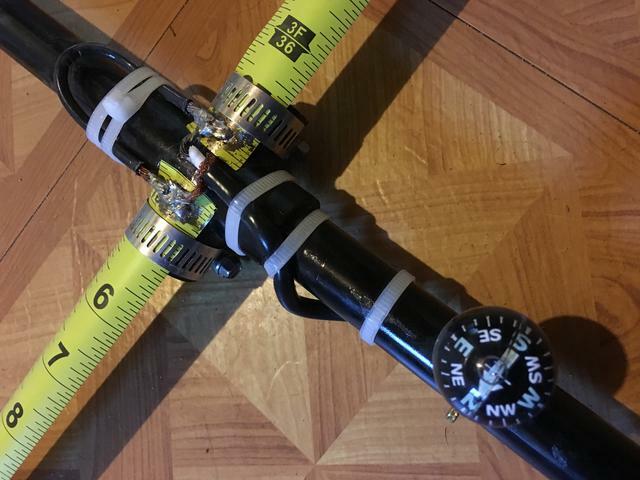 A tape measure beam will 'roll up' and fit in a mailer tube or 3 inch PVC size pipe for use as direction finding gear....a good skill to practice. I modeled mine using the YagiCAD freeware, but after a lot of playing with the different parameters finally just left the defaults for the center frequency I wanted and went with that. SWR below 1.5 across a 5 MHz range (2.5 up, 2.5 down from center). This from a few years ago. Hairpin match with 10 AWG stranded wire, forget now if I got the length of the match from YagiCAD or somewhere else. Compass because RDF use, it's handy. I first used a cheap tape measure but had a tear on the active element near the hose clamp after a few uses in the field, lots of bending from tree branches. Replaced that element with tape from a better quality tape measure and so far so good. I do not know....Kinda hate the tape measure concept, even though it works. - thanks for mentioning the YagiCad program..did not know it existed. Just googled it. - will it work if you connect the feed on the hoseclamp or its screw? I have left 6 inches of pipe back from the reflector as a handle. is it advisable to place the HT there?